CHARLOTTE, N.C., February 26, 2018 /3BL Media/ -- Thirteen organizations spanning 42 counties in North Carolina and South Carolina will receive more than $900,000 in new grants from Duke Energy's Water Resources Fund to support environmental and wildlife programs. 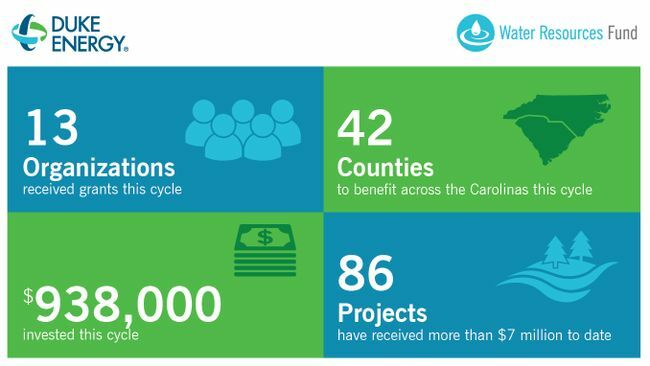 The fund is a $10 million multiyear commitment from Duke Energy to help local organizations continue to protect and improve the environment, including waterways used year-round across the Carolinas and neighboring states. "Water is a shared natural resource that connects us all," said David Fountain, Duke Energy's North Carolina president. "To keep our waterways healthy, it takes communities coming together with a shared commitment. We're proud to support these 13 organizations that are implementing innovative projects to protect our water resources." "The museum's goal is to spark curiosity and foster a deep appreciation for the sciences and the natural beauty of western North Carolina," said Anna Priest, executive director of the Asheville Museum of Science (AMOS). "AMOS' French Broad River exhibit will offer a one-of-a-kind interactive learning experience to the public. We thank Duke Energy for its support and are eager to launch this project, allowing visitors to learn about the importance of the French Broad River in the western North Carolina ecosystem." "Our communities and regional economies are powered by the rivers and waterways that these projects will support," said Kodwo Ghartey-Tagoe, Duke Energy's South Carolina president. "We are committed to work alongside these 13 organizations to ensure future generations enjoy the benefits of our waterways." "A core goal of Kalmia Gardens is to protect and preserve habitat," said Daniel Hill, assistant director of Kalmia Gardens of Coker College. "With this grant, the Gardens will not only restore a native ecological community, but also help protect Black Creek from urban runoff." Duke Energy has awarded more than $7 million in grants to 86 projects in the Carolinas and Virginia since establishing the fund in 2015. Recipients are selected by an independent body that includes five environmental experts and two Duke Energy employees. View an interactive map showcasing all 86 grantees at duke-energy.com/H2O. Asheville Museum of Science (NC) French Broad River Interactive Exhibit & Education Programming – $100,000 to construct an interactive exhibit emulating the French Broad River to teach hydrology fundamentals and the impact of humans along a river's course. Durham Soil and Water Conservation District (NC) Bionomic Educational Training Center (BETC) – $26,500 to support a curricula-based workforce-development training program that teaches students how to design and install stormwater best management practices (BMPs). Girl Scouts Hornet's Nest Council (NC) Wonders of Water and Wildlife (WoWW) Lake Nature Trail – $54,750 to help construct the Lake Nature Trail, which will increase community awareness of water resource protection by developing project infrastructure and hands-on learning opportunities. Macon Soil and Water Conservation District (NC) Macon County Blueways Initiative – $61,625 to install five canoe launches and one stream access area at three Macon County Recreation Parks.Tar River Land Conservancy (NC) Knap of Reeds Watershed Protection Project – $100,000 to purchase 842 acres of watershed area in the Upper Neuse River Basin. Tourism-Recreation Investment Partnership for Davidson County Foundation (NC) Daniel Boone Heritage Canoe Trail – Wil-Cox Bridge/Trading Ford Recreation Area – $100,000 to increase accessibility and awareness of the Yadkin River by improving access points and amenities. Town of Davidson (NC) Davidson Elementary School Headcut Stream Stabilization – $91,817 to protect existing habitat and improve water quality by reducing sediment pollution downstream and stabilizing a headcut along the South Prong West Branch of the Rocky River. Town of Star (NC) Forks of Little River Passive Park Amenities – $30,000 to improve amenities, including construction of a picnic shelter beside the Little River and a culvert to make the hiking trail more accessible and safe. Town of Sunset Beach (NC) Living Shoreline at Town Park – $34,950 to preserve the shoreline and provide food and shelter for aquatic and terrestrial species through use of riparian and marsh grasses and a "living shoreline." City of Rock Hill (SC) Cotton Mill Stream Restoration – $100,000 to restore eroded Cotton Mill stream banks to improve water quality and enhance the plant, fish and wildlife habitat. Ducks Unlimited Inc. (SC) Santee National Wildlife Refuge Bluff Unit – $75,000 to enhance the publicly accessible 726-acre wetland complex, including the Dingle Pond, at the Santee National Wildlife Refuge Bluff Unit. Kalmia Gardens (of Coker College) (SC) Stormwater Best Management Practice Benefiting Black Creek – $77,500 to reduce the pollution load entering Black Creek from a 300-acre urban watershed while restoring site ecologies and implementing a regenerative stormwater conveyance (RSC) system. Open Space Institute Land Trust (SC) Black River Conservation Corridor: Enhancing Conservation, Habitat Connectivity & Public Access – $86,000 to protect critical land in the Black River Conservation Corridor and improve public access.